No visit to West Country railways would be complete without paying tribute to the engineering genius of Portsmouth born Isambard Kingdom Brunel. 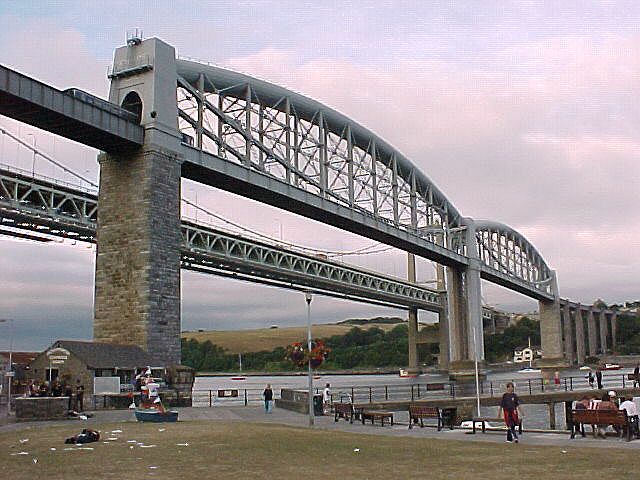 Here, perhaps, is his finest memorial, completed shortly before his death in 1859, the great Royal Albert Bridge across the Tamar between Plymouth and Saltash. The two main sections were built on the shore and floated out into the river - then lifted into place by tide, rising a few more feet every 12 hours! Alongside Brunel's bridge is the modern suspension road bridge carrying the main A38 into Cornwall. Itself a major engineering achievement, the bridge carried its highest ever daily number of vehicles (26,000+) as tourists streamed out of Cornwall after the total eclipse of the Sun on 11th August. Substantial engineering work is now beginning to widen the road bridge - in situ and with the traffic flowing!